Moths might be harmless when they are out in the wild, but indoors they are certified pests. Any home dweller knows to attack relentlessly with bug spray when they see a moth indoors that would otherwise love to feast on clothes or items in the pantry. Here is a round up of the top ten moth traps that you can use so you don’t have to chase the moths around your home. Tired of using smelly mothballs in your closet to keep moths away? Here is a harmless alternative that is also non toxic. The GreenWay moth trap is specially meant for clothes moths, especially those that infest men and women’s clothes. 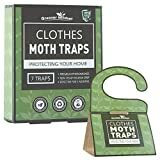 You can place this moth trap in your closet or around furniture to prevent destructive moths from eating up your clothes. The pack contains two traps and two lures in each box. This product is recommended in case you have very young kids or pets in the home, as the product is completely harmless. Makes for a great alternative to nasty chemical sprays that you might otherwise use. The best way to get a critter is to attract them using smells or chemicals that are familiar to their nature, thus leading them to their death. The Pro-Pest Pantry moth trap does just that, through the pheromones that are loaded in the glue that the moths can then get stuck to once they come in contact. This paper is free of pesticides and can last up to two months. It is ideal for use in the kitchen against moths that attack pantry items and even against cigarette beetles. A pack contains 6 traps in each, with two different pheromones to attract different kinds of insects. If you are tired of having to spray down your pantry for pests every couple of months, you may want to try a non toxic approach this time around. The Catchmaster 812sd is a moth trap that is specially meant for pantry moths. It is easy to use and long lasting so you can leave it undisturbed on your pantry shelf for weeks together before having to discard. This trap is perfect to target common flour and grain moths, Indian meal, Mediterranean flour, raisin and tobacco moths. This comes with a set of three moth traps, with two traps in each set. Need an attractive looking solution to your moth problem? Try this Greener Mindset moth trap on for size. Specially designed for pantry moths, this moth trap comes with a hook for easy hanging on to a pantry shelf rod. It is also easy to set up as you just need to peel off the paper to expose the glue. The glue contains pheromones to attract moths including Indian Meal moths and other moths that lurk around food items. It is not recommended for use with cloth moths. Kitchen pests will soon be a thing of the past with the proudly Made in USA Able Catch 6 pantry moth. This trapezoid moth trap offers a larger surface area for moths to get trapped on. It is best suited for pantry moths and even has tabs on the top so that they can be hung in the pantry, saving up precious shelf space. The inconspicuous packaging makes it look right at home among your pantry ingredients, and the product is completely non toxic. Another advantage this moth trap offers over others is its long durability. You can go for 90 days without replacing the unit. Each pack contains six moth traps. Here’s a stylish looking moth trap that you can use in your pantry. 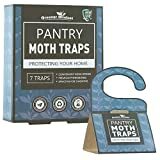 These premium pantry moth traps have a lovely green leaf design on the front that makes it a pleasure to look at while it sits on your pantry shelf, keeping your food safe from moth attacks. This moth trap has pheromones embedded in the glue to specially attract Indian meal moths and other common pantry pests. You can use it to keep all sort of dry meal and fruits safe from moths in a non toxic way. Each pack contains seven moth traps, each of which are individually sealed so that they are ready to use once opened. Results are guaranteed within just a week of use! Here’s one for floral lovers who are tired of using ugly moth traps in their cupboards. The Mottenfalle Clothes Moth Trap comes in an attractive floral packaging that can be easily hung or placed in a closet. 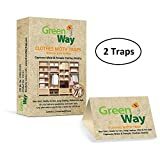 The non toxic pheromones embedded in the glue can trap moths very effectively giving your clothes three months of protection from nasty pests. Each box contains six moth traps which are odor free, pesticide free and are eco friendly. Highly effective for use with furniture, carpets, clothes and fur. These moth traps are also extremely easy to set up – all you need to do is to peel off the protective covering and leave the glue exposed for moths to find. Gives quick and effective results indoors. The Germans always mean business when it comes to cars, technology and now even moth traps. This German made product has been proven to be highly effective in trapping closet moths. You can say goodbye to smelly mothballs in your clothes or harmful chemical pest sprays. 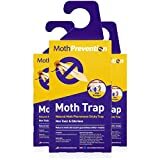 The MothPrevention moth trap has a hook so that it can be hung within your closet space, and the best part of the glued paper is that it can be replaced with refills provided in the pack. This makes it a very economical solution. Showing results within seconds of opening it up, these moth traps work for 90 days and even come with a guarantee. Need an attractive looking solution to your moth problem? Try this Greener Mindset moth trap on for size. Specially designed for clothes moths, this moth trap comes with a hook for easy hanging on to a pantry shelf rod. It is also easy to set up as you just need to peel off the paper to expose the glue. The glue contains pheromones to attract moths that usually infest clothes. Each box contains seven individual moth traps that are designed to last up to three months. True to its name, the moth trap is made of recycled material so that it is eco friendly in every way. Finally, the top product on our list had to be Dr. Killigan’s premium moth traps. Breathing luxury in every last detail of the product packaging this moth trap even has an amusing caption on the cover that reads ‘Killing them softly’. Dr. Killigan certainly means business because this moth trap is designed to target all kinds of food moths like the Indian Meal moth. You don’t need to use any food to lure the moths into the trap because this moth trap comes preloaded with pheromones. Choose between a pack of 6 or a pack of 20, which even come in two stylish design options. Get rid of your pesky moth problem with one of these great moth traps available online, or at a store near you!